Local anti-war protesters wasted little time Wednesday night reacting to news that the U.S. has begun military strikes against Iraq. The activists say they won't back down, and will increase the number and intensity of their protests. 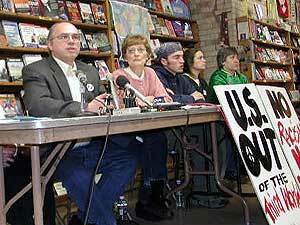 St. Paul, Minn. — A coalition of anti-war groups held a late night news conference in a Minneapolis bookstore, expressing their opposition to the attack on Iraq. Jess Sundin of the Anti-War Committee calls the military strike against Iraq horrifying. She says those who oppose the war will continue to protest it every day until it stops. "We know that the administration expects us to fall silent, and the opposite is going to be true," says Sundin. "The protests are going to be more frequent, there's going to be more people. They're going to be louder, we're going to march further. The protests are going to get more serious, not less serious. We're not giving up." Ryan Helgeson spoke on behalf of Students Against War. He said the human and financial costs of a war are too high. "The administration is proposing to spend billions and billions of dollars, while we here at home are suffering a tremendous budget crisis. The money could go toward education, jobs, creating prosperity here at home," says Helgeson. "And even if a fraction of that money went to supporting the people of Iraq, it would help to alleviate their plight there." Though most students at the University of Minnesota are on spring break this week, Helgeson says those who are on campus will leave classes at noon Thursday to gather at the Northrup Mall on campus. Various speakers and teach-ins are scheduled. Helgeson says the students will march from campus to the Federal Building in downtown Minneapolis where a large anti-war protest is scheduled for 4:30. A few hours before the first reports of U.S. attacks on Baghdad, about 1,000 anti-war protesters turned up for what has become a weekly rally at the Marshall Ave. Lake St. bridge. A handful of counter-protesters also showed up, to demonstrate their support for the war. For years, the bridge has been the site of weekly protests opposing the U.N. sanctions against Iraq that have been in place since 1991 -- the end of the first gulf war. John Maus of Bloomington says he's been coming to the bridge for three years. He says he's opposed to a U.S.-led war with Iraq for several reasons. "First of all, it's illegal. And for the wrong reason. Its stated reason has been changing all the time," says Maus. "And I think that people of Iraq should have their own choice of who they want to have for a leader, rather than be occupied by the same country that's been pressing them with these sanctions for the last 12 years." Demonstrator Cecilia Dodge of St. Paul was equally opposed to U.S. policy and President Bush. "I think we're the aggressors here. I think George Bush could be accused of being a dictator at this point. And this is a country that maybe needs some solutions, but doesn't need us to attack them," says Dodge. Most protesters held signs. They read: "Struggle for peace with love," "National security requires global justice," and "Support our troops: bring them home." The last sign is a twist on the latest lawn sign battle that began months ago. First came the "Say no to war in Iraq" signs. In response, a Twin Cities man made his own sign reading "Liberate Iraq." It's become the symbol of the counter anti-war movement. During the bridge protest a few cars and trucks drove by displaying the "Liberate Iraq" signs, and American flags. There were a couple of people, including Minneapolis resident John Swanson, who stood among the anti-war protesters on the bridge with his Liberate Iraq poster. "I think that people forget about 9/11," says Swanson. "I think if you go to Colin Powell's defense speech, he gives a lot of good information that ties Saddam Hussein to 9/11. And I just think people are ignoring that." Swanson says he thinks he and the anti war protesters ultimately have a common goal -- to provide Iraqi people with food and medicine. The question, he says, is how to achieve that goal.